This visual representation of camp also lists of each program area and the programs they offer. This PDF allows you to see the merit badges offered at camp along with days and times. This camping guide contains information for both new and returning troops. 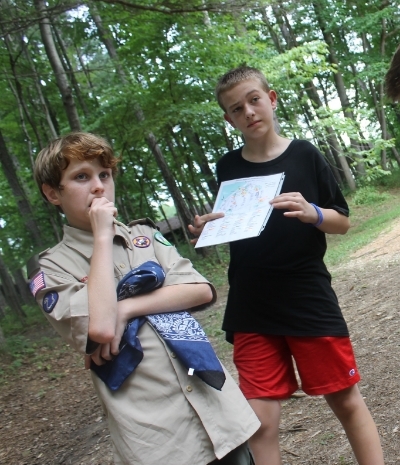 Inside scouts and adults can learn about the programs offered at Ransburg Scout Reservation. Information about planning for camp, such as dates, fees, and camp policies is also inside. Photos from the 2017 Photography Merit Badge fill this handy booklet showing everything you need to know for camp. Click the blue title above to view the guide online with full resolution photos, or the following link to download a copy with lower-quality photos. Adults planning to take training while at Ransburg Scout Reservation should view this schedule for the list of days and times. Please also visit the "Health Form Information" page found under "Planning for Camp." This form is a .pdf of the most recent of the Crossroads of America Council's BSA Health Form (2014 Printing). Contact zwhite@ransburgbsa.org with special dietary needs including vegetarian, gluten free, medical, and religious at least 2 weeks before arrival at camp. Print out and bring this completed form with a parent signature if you are registered for the ATV program at Ransburg Scout Reservation. Print out and bring this completed from with a parent signature if you are a part of RansburgX's trip to Marengo Cave. Do you enjoy your weeks spent at Ransburg Scout Reservation? Those age 15 and up can apply to be on camp staff. Our staff is made up of youth and adults, males and females, who follow the scout oath and law. Contact our human resources (hr@ransburgbsa.org) with questions about the application process or other application needs.